MANILA, Philippines - Private weather information provider Weather Philippines Foundation (WPF) has released on Wednesday, December 3, 2014 a separate bulletin to track movement of Typhoon Hagupit (local name Ruby). WPF says Typhoon Hagupit rapidly strengthens into a 150 kph typhoon as it approaches Yap, Ulithi and the other smaller islands of Western Micronesa. It remains a threat to Eastern Philippines particularly Eastern Visayas this weekend. "The residents and visitors along Western Micronesia, Republic of Palau, Eastern Philippines (from Eastern Luzon down to Eastern Mindanao) should closely monitor the development of Hagupit," the weather foundation said. 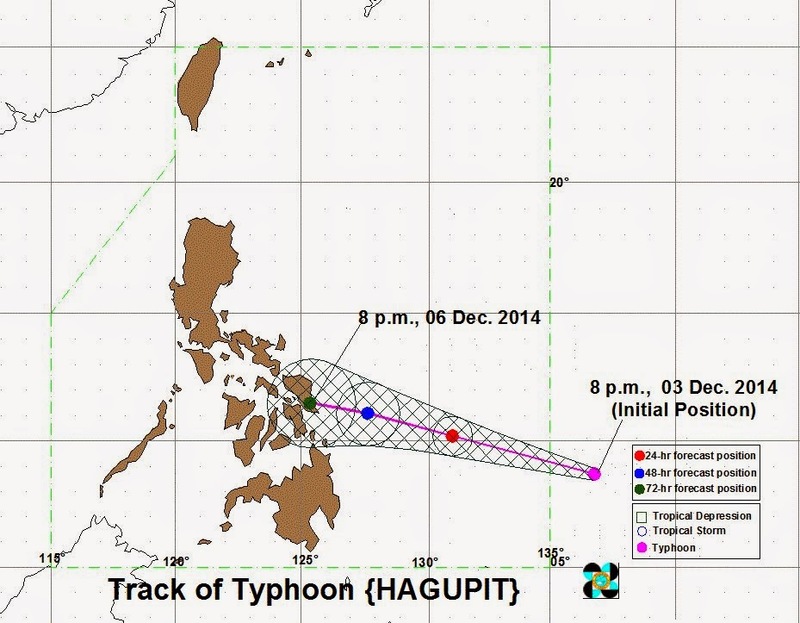 WPF said that Hagupit will enter the Philippine Area of Responsibility (PAR) by Thursday morning (December 4). By early Friday morning, the typhoon shall be traversing the southeastern part of the Philippine Sea. It is expected to continue gaining strength throughout the forecast outlook as it moves over the warmer sea surface temperatures (SSTs) of the Philippine Sea. Advance Intensity Forecast (AIF) shows its 10-minute maximum sustained winds increasing rapidly to 215 kph (at near-Super Typhoon strength) by early Friday morning. By early morning of Saturday, WPF says it will attain Super Typhoon strength (220kph) as it slows down over the Philippine Sea, closer to Eastern Samar about 370 km east of Borongan City, Eastern Samar. Note: WeatherPhilippines Foundation, Inc. advised that information broadcasted and distributed by PAGASA remains as official data. The foundation aims to deliver critical and accurate weather forecasts to the Filipino community, with the hope of improving nationwide disaster preparedness, and timely response to variable weather conditions. It uses Aboitiz Group's resources and network, MeteoGroup's technical expertise and roughly 1,000 automated weather station/devices installed across the Philippines. PAGASA said that Typhoon Ruby is expected to make landfall this weekend in the Visayas region. The possibility of Hagupit making a direct hit on Philippine landmass went up 75% as of Wednesday, PAGASA deputy administrator Jun Dalida said. As of 10pm on Wednesday, PAGASA said that Typhoon Hagupit is expected to enter PAR by tomorrow early morning. At 10:00 PM today, the center of Typhoon Hagupit was located based on all available data at 1,108 km East of Hinatuan City, Surigao del Sur (8.8°N, 136.4°E). It has maximum sustained winds of 160 kph near the center and gustiness of up to 195 kph. It is forecast to move West Northwest at 25 kph. The typhoon is expected to be at 598 km East Southeast of Guiuan, Eastern Samar tomorrow evening and at 219 km East of Guiuan, Eastern Samar by Friday evening (December 5). By Saturday evening, it is expected to be in the vicinity of Borongan Eastern Samar. PAGASA said that Hagupit is too far to affect any part of the country but it is expected to enhance northeasterly winds over the seaboards of Northern Luzon and the eastern seaboard of Central Luzon resulting to rough to very rough sea conditions over the aforementioned areas. Fisherfolks and those using small seacrafts are advised not to venture out over the said seaboards. PAGASA said it will announce detailed typhoon track 48 hours before it makes landfall. Officials also dismissed fears that the typhoon will be as strong as typhoon Yolanda (Haiyan) but it will be strong nonetheless to cause storm surges, destroy agricultural farms and blow away houses made of light materials. The Department of the Interior and Local Government (DILG) has ordered all local government units (LGUs) expected to be affected by Typhoon Ruby to prepare for its possible entry into the PAR by Thursday. In an alert bulletin issued to LGUs in Regions 5, 6, 7, 8, and Caraga, Interior and Local Government Sec. Mar Roxas ordered the LGUs to immediately convene their respective local disaster risk reduction management councils (LDRRMCs) and make the necessary preparation to cushion the impact of the typhoon. He ordered them to prepare the necessary food packs, medicines, fuel and first aid to be distributed to their constituents once the typhoon enters PAR. He also directed the LGUs to immediately evacuate the people living along coastal communities to higher ground to ensure their safety. 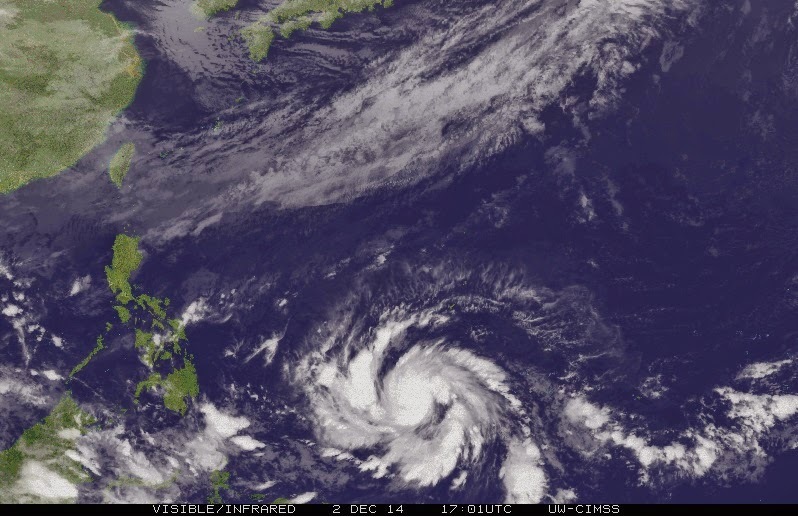 “We need to take each typhoon entering the PAR seriously. Ruby is said to be Yolanda-like in strength and this is ominous,” Roxas said.